The Gospel Music Arts Telecast is broadcast on local television channels. Be sure to check back with us often as new stations and times are added. 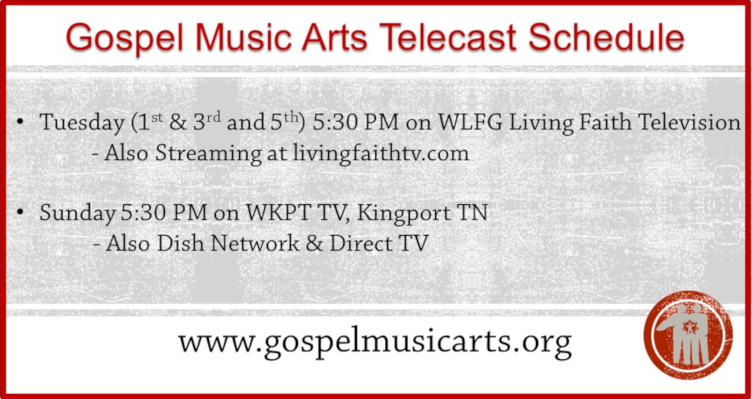 The Gospel Music Arts Telecast can be seen streaming live on WLFG on the 1st and 3rd Tuesday at 5:30pm. WLFG is Living Faith TV, a premier, full-time, multi-regional television network is committed to engaging people with the Word of God by connecting them to the best of Ministries from the Smoky Mountain, Blue Ridge Mountain & Appalachian Mountain Regions of the United States. Click below to view WLFG. Please note this channel streams programming 24/7. The Gospel Music Arts Telecasts will only be streaming as indicated above.